Borla Racing Pipes are a clever new performance product that creates power while adding a great new sound to your exhaust system. In testing, customers and racers alike noticed the power increase you’ve come to expect from BORLA, but all commented on the great new exhaust tone being emitted. 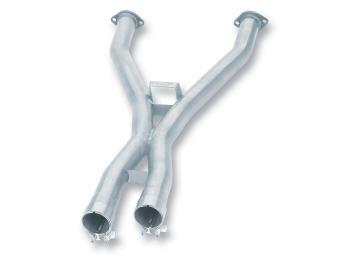 This sophisticated component is a perfect compliment to the famous Borla Cat-Back systems and is even lighter than the stock system, mainly due to the aircraft-grade high quality austenitic lightweight stainless steel used in every BORLA exhaust component. Additional attributes include an extremely simple, bolt-in replacement for the factory mid-pipe that further enhances that famous BORLA growl of power.